The Trojan War was waged, according to legend, against the city of Troy in Asia Minor, by the armies of the Achaeans (Mycenaean Greeks), after Paris of Troy stole Helen from her husband Menelaus, king of Sparta. The war is among the most important events in Greek mythology and was narrated in many works of Greek literature, of which the two most famous are the Iliad and the Odyssey of Homer. The Iliad relates a part of the last year of the siege of Troy, while the Odyssey describes the journey home of Odysseus, one of the Achaean leaders. Other parts of the story were narrated in a cycle of epic poems, which has only survived in fragments. Episodes from the war provided material for Greek tragedy and other works of Greek literature, and Roman poets like Virgil and Ovid. The war sprang from a quarrel between the goddesses Athena, Hera and Aphrodite, after Eris, the goddess of strife and discord, gave them a golden apple with the inscription "to the fairest" (sometimes known as the Apple of Discord). The goddesses went to Paris, who judged that Aphrodite, as the "fairest", should receive the apple. In exchange, Aphrodite made Helen, the most beautiful of all women, fall in love with Paris, who took her to Troy. Agamemnon, king of Mycenae, and the brother of Helen's husband Menelaus, led an expedition of Achaean troops to Troy and besieged the city for ten years. After the deaths of many heroes, including the Achaeans Achilles and Ajax, and the Trojans Hector and Paris, the city fell to the ruse of the Trojan Horse. The Achaeans mercilessly slaughtered the Trojans and desecrated the temples, thus earning the gods' wrath. Few of the Achaeans returned to their homes and many founded colonies in distant shores. The Romans later traced their origin to Aeneas, one of the Trojans, who was said to have led the surviving Trojans to Italy. Ancient Greeks thought the Trojan War to be a historical event. They believed that it took place in the 13th or 12th century BC, and that Troy was located in the vicinity of the Dardanelles, which is in modern day Turkey. By modern times both the war and the city were widely believed to be non-historical. In 1870, however, the German archaeologist Heinrich Schliemann excavated a site in this area which he believed to be the site of Troy, and at least some archaeologists agree. There remains no certain evidence that Homer's Troy ever existed, still less that any of the events of the Trojan War cycle ever took place. 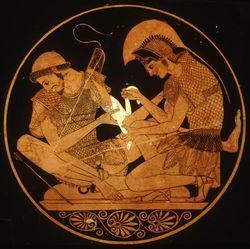 Many scholars would agree that there is a historical core to the tale, though this may simply mean that the Homeric stories are a fusion of various tales of sieges and expeditions by Greeks of the Bronze Age or Mycenean period. Those who believe that the stories of the Trojan War derive from a specific historical conflict usually date it to between 1300 BC and 1200 BC, usually preferring the dates given by Eratosthenes (1194 BC–1184 BC) which roughly correspond with the burning of Troy VIIa. According to Greek mythology, Zeus had become king of the gods by overthrowing his father Cronus; Cronus in turn had overthrown his father Ouranos. Zeus was not faithful to his wife (and sister) Hera and had many relationships from which many children were born. Since there were too many people populating the earth already he came up along with either Momos or Themis with the idea of the Trojan War in order to depopulate the Earth, especially of his demigod descendants. Zeus came to learn from either Themis or Prometheus, after Heracles had released him from Caucasus, that he himself would be overthrown by a son. Another prophecy said of the sea-nymph Thetis, with whom Zeus had an affair, that her son would be greater than his father. Possibly for one or both of these reasons, Thetis was betrothed to a now-elderly human king, Peleus son of Aiakos, either upon Zeus' orders, or because Thetis wished to please Hera since she had raised her. 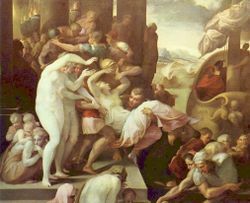 All of the gods were invited to Peleus and Thetis' wedding and brought gifts, except Eris ("Discord"), who was stopped at the door by Hermes on Zeus' order. Insulted, she threw from the door a gift of her own: a golden apple (το μήλον της έριδος) on which were inscribed the words Tēi Kallistēi ("To the fairest"). The apple was claimed by Hera, Athena, and Aphrodite. They quarreled bitterly over it, and none of the other gods would venture an opinion favoring one, for fear of earning the enmity of the other two. Eventually, Zeus ordered Hermes to lead the three goddesses to Paris, a prince of Troy, who, unaware of his ancestry, was being raised as a shepherd in Mount Ida, because of a prophecy that he would be the downfall of Troy. 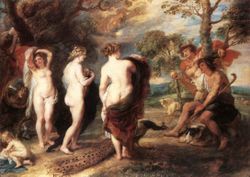 The goddesses appear to him naked, he is unable to decide between them so they then try to bribe the shepherd. Athena offered Paris wisdom, skill in battle, and the abilities of the greatest warriors; Hera offered him political power and control of all of Asia, and Aphrodite offered him the love of the most beautiful woman in the world, Helen of Sparta. Paris awarded the apple to Aphrodite, and, after several adventures, returned to Troy and was recognized by his royal family. Peleus and Thetis bore a son, whom they named Achilles. It was foretold that he would either die of old age after an uneventful life, or die young in a battlefield and gain immortality through poetry. Furthermore Calchas had prophesied, when Achilles was nine, that Troy could not fall again without his help. As an infant Thetis tried to make Achilles immortal. First she held him over fire to burn away his mortal parts every night and rubbed him with ambrosia during the day Peleus, who had already lost six sons this way, discovered this and stopped it. Then she bathed him in the River Styx, making him invulnerable wherever he had touched the water. She had held him by the heel, so that part remained mortal, and so he remained human and not a god (hence the expressions Achilles heel for an isolated weakness). He grew up to be the greatest of all mortal warriors. After Calchas' prophesy Thetis hid Achilles in Skyros at the court of king Lycomedes where he was disguised as a girl. The most beautiful woman in the world was Helen, one of the daughters of Tyndareus, king of Sparta. Her mother was Leda, who had been seduced (or raped) by Zeus in the form of a swan; accounts differ over which of Leda's four children were fathered by Zeus and which by Tyndareus. Helen though is usually given as Zeus' daughter and sometimes Nemesis is given as her mother. Helen had scores of suitors, and her father was unwilling to choose one for fear the others would retaliate violently. Finally, one of the suitors, Odysseus of Ithaca, proposed a plan to solve the dilemma. 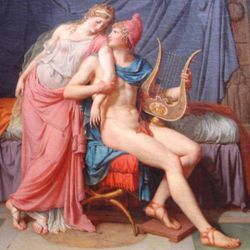 In exchange for Tyndareus' support of his own suit towards Penelope, he suggested that Tyndareus allow Helen to choose her husband (instead of their father, as was typical in Greece from the mythical age until the twentieth century, though a few mythographers have Tyndareus choosing him) and require all of Helen's suitors to promise that they would defend the marriage of Helen, regardless of whom she chose. The suitors duly swore the required oath on the severed pieces of a horse, although not without a certain amount of grumbling. Helen chose Menelaus to wed. He had humbly not petitioned for her himself, but instead sent his brother Agamemnon on his behalf. He had promised Aphrodite a hecatomb, a sacrifice of 100 oxen, if he won Helen, but forgot about it, and earned her wrath. The two brothers had been living at Tyndareus' court since being exiled from their homeland of Mycenae after their father, Atreus, was killed and had his throne usurped by his brother Thyestes and Thyestes' son Aegisthus. Menelaus inherited Tyndareus' throne of Sparta with Helen as his queen when her brothers Castor and Pollux became gods and Agamemnon married Helen's sister Clytemnestra and took back the throne of Mycenae. On a diplomatic mission to Sparta, Paris fell in love with Helen. Menelaus had to leave for Crete to bury his uncle Crateus. Paris with Aphrodite's help, kidnapped or seduced her and sailed to Troy carrying off part of Menelaus' treasure. Hera, still jealous over his judgement sent a storm. The storm made the lovers land in Egypt, where the gods replaced Helen with a likeness of her made of clouds, Nephele. (The myth of Helen being switched is attributed to the 6th century BC Sicilian poet Stesichorus. For Homer the true Helen was in Troy). Then the ship landed in Sidon before reaching Troy. Paris, fearful of getting caught, spent some time there and then sailed to Troy. Paris' abduction of Helen had several precedents. Io was taken from Mycenae, Europa, was taken from Phoenicia, Jason took Medea from Colchis, and the Trojan princess Hesione had been taken by Heracles who gave her to Telamon of Salamis. According to Herodotus, Paris was emboldened by these examples to steal himself a wife from Greece, and expected no retribution, since there had been none in the other cases. Menelaus asked Agamemnon to uphold his oath. He agreed and sent him Nestor along with other emissaries to all the Achaean kings and princes, who were called to make good their oaths and retrieve Helen. At Scyros Achilles had an affair with the king's daughter Deidamea, resulting in a child, Neoptolemus. Odysseus, Telamonian Ajax, and Achilles' tutor Phoenix went to retrieve Achilles. Achilles' mother disguised him as a woman so that he wouldn't need to go to war, but, according to one story they blew a horn, and Achilles revealed himself by seizing a spear to fight intruders rather than fleeing. According to another, they disguised themselves as merchants bearing trinkets and weaponry, and Achilles was marked out from the other women by admiring the wrong goods. Pausanias says that according to Homer, Achilles did not hide in Scyros, but rather conquered the island, as part of the Trojan War. The Achean forces gathered at Aulis. All the suitors sent their forces except King Cinyras of Cyprus. Though he sent breastplates to Agamemnon and promised to send 50 ships, he sent only one real ship led by the son of Mygdalion and 49 ships made of mud. Idomeneus was willing to lead the Cretan contingent in Mycenae's war against Troy, but only as a co-commander which he was granted. The last one to arrive was Achilles, who was then 15 years old. Following a sacrifice to Apollo, a snake slithered from the altar to a sparrow's nest in a plane tree nearby. It ate the mother and her eight babies, then was turned to stone. Calchas interpreted this as a sign that Troy would fall in the tenth year of the war. When the Acheans left for the war, they did not know the way, and accidentally landed in Mysia, ruled by King Telephus son of Heracles who had led a contingent of Arcadians to settle there. In the battle, Achilles wounded Telephus, who had killed Thersander. The wound would not heal so Telephus asked an oracle "What will happen to the wound?". The oracle responded, "he that wounded shall heal". The Achean fleet then set sail and was scattered by a storm. Achilles landed in Scyros and married Deidameia. A new gathering was set again in Aulis. Telephus went to Aulis, and either pretended to be a beggar, asking Agamemnon to help heal his wound, or kidnapped Orestes and held him for ransom, demanding the wound be healed. Achilles refused, claiming to have no medical knowledge. Odysseus reasoned that the spear had inflicted the wound and the spear must be able to heal it. Pieces of the spear were scraped off onto the wound, and Telephus was healed. Then Telephus showed the Acheans the route to Troy. Some scholars have regarded the expedition against Telephus and its resolution as a derivative reworking of elements from the main story of the Trojan War, but it has also been seen as fitting the story-pattern of the "preliminary adventure" that anticipates events and themes from the main narrative, and therefore as likely to be "early and integral". Eight years after the storm had scattered them, the fleet of more than a thousand ships was gathered again. But when they had all reached Aulis, the winds ceased. The prophet Calchas stated that the goddess Artemis was punishing Agamemnon for killing a sacred deer (or a deer in a sacred grove) and boasting that he was a better hunter than she. The only way to appease Artemis, he said, was to sacrifice Iphigenia, who was either the daughter of Agamemnon and Clytemnestra, or of Helen and Theseus entrusted to Clytemnestra when Helen married Menelaus. Agamemnon refused, and the other commanders threatened to make Palamedes commander of the expedition. According to some versions, Agamemnon relented, but others claim that he sacrificed a deer in her place, or that at the last moment, Artemis took pity on the girl, and took her to be a maiden in one of her temples, substituting a lamb. Hesiod says that Iphigenia became the goddess Hecate. The Achean forces are described in detail in the Catalogue of Ships, in the second book of the Iliad. They consisted of 28 contingents from mainland Greece, the Peloponnese, the Dodecanese islands, Crete and Ithaca, comprising 1178 pentekontoroi, that is ships with 50 rowers. Thucydides says that according to tradition there were about 1200 ships, the Boeotian ships had 120 men while Philoctetes ships only had the fifty rowers, these probably being maximum and minimum. These numbers would mean a total force of 70,000 to 130,000. Another catalogue of ships is given by Apollodorus that differs somewhat but agrees in numbers. Some scholars have claimed that Homer's catalogue is an original Bronze Age document, possibly the Achaean commander's order of operations. Others believe it was a fabrication of Homer. The Trojan allies are also listed in the second book of the Iliad, consisting of the Trojans themselves, led by Hector, and various allies listed as Dardanians led by Aeneas, Zeleians, Adrasteians, Percotians, Pelasgians, Thracians, Ciconian spearmen, Paionian archers, Halizones, Mysians, Phrygians, Maeonians, Miletians, Lycians led by Sarpedon and Carians. Nothing is said of the Trojan language; the Carians are specifically said to be barbarian-speaking, and the allied contingents are said to have spoken multiple languages, requiring orders to be translated by their individual commanders. It should be noted though that the Trojans and Acheans in the Iliad share the same religion, same culture and the enemy heroes speak to each other in the same language, though this could be dramatic effect. Philoctetes was Heracles' friend and, because he lit Heracles's funeral pyre when no one else would, he received Heracles' bow and arrows. He sailed with seven ships full of men to the Trojan War, where he was planning on fighting for the Acheans. They stopped either at Chryse for supplies, or in Tenedos along with the rest of the fleet. Philoctetes was then bitten by a snake. The wound festered and had a foul smell; Odysseus advised, and the Atreidae ordered Philoctetes to stay on Lemnos. Medon took control of Philoctetes's men. While landing on Tenedos Achilles killed king Tenes, son of Apollo, despite a warning by his mother that if he did so he would be killed himself by Apollo. From Tenedos Agamemnon sent an embassy to Priam composed of Menelaus, Odysseus and Palamedes asking for Helen's return. The embassy was refused. Philoctetes stayed on Lemnos for ten years, which was a deserted island according to Sophocles' tragedy Philoctetes, but according to earlier tradition was populated by Minyans. Calchas had prophesied that the first Achean to walk on land after stepping off a ship, would be the first to die. Thus even Achilles hesitated to land. Finally Protesilaus, leader of the Phylaceans, landed first. Achilles jumped second and killed Cycnus son of Poseidon. The Trojans then fled to the safety of the walls of their city. Protesilaus had killed many Trojans but was killed by Hector or Aeneas, Achates or Ephorbus. The Acheans buried him as a god on the Thracian peninsula, across the Troad. After Protesilaus' death, his brother, Podarces, joined the war in his place. The Acheans besieged Troy for nine years. This part of the war is the least developed among surviving sources, which prefer to talk about events in the last year of the war. After the initial landing the army was gathered in its entirety again only in the tenth year, due to lack of money as Thucydides deduces. They raided the Trojan allies and spent time farming the Thracian peninsula. Troy was never completely besieged, thus it maintained communications with the interior of Asia Minor. Reinforcements continued to come until the very end. Also the Acheans controlled only the entrance to the Dardanelles, Troy and her allies controlled the shortest point at Abydos and Sestus and communicated with allies in Europe. He also took Lesbos and Phocaea, then Colophon, and Smyrna, and Clazomenae, and Cyme; and afterwards Aegialus and Tenos, the so-called Hundred Cities; then, in order, Adramytium and Side; then Endium, and Linaeum, and Colone. He took also Hypoplacian Thebes and Lyrnessus, and further Antandrus, and many other cities. Kakrides comments that the list is wrong in that it extends too far into the south. Other sources talk of him taking Pedasus, Monenia Mythemna (in Lesbos) and Peisidice. Among the loot from these cities was Briseis from Lyrnessus who was awarded to him and Chryseis from Hypoplacian Thebes who was awarded to Agamemnon. Achilles captured Lycaon, son of Priam, while he was cutting branches in his father's orchards. Patroclus sold him as a slave in Lemnos, where he was bought by Eetion of Imbros and brought back to Troy. Only 12 days later Achilles slew him (after the death of Patroclus). Telamonian Ajax laid waste the Thracian peninsula of which Polymestor, a son-in-law of Priam, was king. Polymestor surrendered Polydorus, one of Priam's children, of whom he had custody. He then attacked the town of the Phrygian king Teleutas, killed him in single combat and carried off his daughter Tecmessa. Ajax also hunted the Trojan flocks, both on Mount Ida and in the countryside. Numerous paintings on pottery have suggested a tale not mentioned in the literary traditions. At some point in the war Achilles and Ajax were playing a board game (petteia). They were absorbed in the game and oblivious to the surrounding battle. The Trojans attacked and reached the heroes, who were only saved by an intervention of Athena. Odysseus was sent to Thrace to return with grain but came back empty-handed. When scorned by Palamedes he challenged him to do better. Palamedes set out also and returned with a shipload. Odysseus had never forgiven Palamedes for threatening the life of his son. So Odysseus conceived a plot. An incriminating letter was forged, from Priam to Palamedes, and gold was planted in Palamedes' quarters. 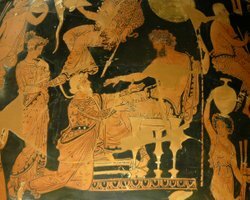 The letter and gold were "discovered", and Agamemnon had Palamedes stoned to death for treason. However, Pausanias, quoting the Cypria, says that Odysseus and Diomedes drowned Palamedes, while he was fishing, and Dictys says that Odysseus and Diomedes, lured Palamedes into a well, which they said contained gold, then stoned him to death. Palamedes' father Nauplius sailed to the Troad and asked for justice, but was refused. In revenge Nauplius traveled among the Achaean kingdoms and told the wives of the kings that they were bringing Trojan concubines to dethrone them. Many of the Greek wives were persuaded to betray their husbands, most significantly Agamemnon's wife, Clytemnestra with Aegisthus, son of Thyestes. Near the end of the ninth year since the landing the Achean army, tired from the fighting and from the lack of supplies, mutinied against their leaders and demanded to return to their homes. According to the Cypria Achilles forced the army to stay. According to Apollodorus Agamemnon brought the Wine Growers, daughters of Anius son of Apollo, who had the gift of producing by touch wine, wheat, and oil from the earth, in order to relieve the supply problem of the army. Chryses, a priest of Apollo and father of Chryseis, came to Agamemnon to ask for the return of his daughter. Agamemnon refused, and insulted Chryses, who prayed to Apollo to avenge his ill-treatment. Enraged, Apollo afflicted the Achaean army with plague. Agamemnon was forced to return Chryseis to end the plague, and took Achilles' concubine Briseis as his own. Enraged at the dishonor Agamemnon had inflicted upon him, Achilles decided he would no longer fight. He asked his mother, Thetis, to intercede with Zeus, who agreed to give the Trojans success in the absence of Achilles, the best warrior of the Achaeans. After the withdrawal of Achilles, the Achaeans were initially successful. Both armies gathered in full for the first time since the landing. Menelaus and Paris fought a duel, which ended when Aphrodite snatched the beaten Paris from the field. With the truce broken, the armies began fighting again. Diomedes won great renown amongst the Acheans, killing the Trojan hero Pandaros and nearly killed Aeneas, who was only saved by his mother Aphrodite. With the assistance of Athena, he then wounded the gods Aphrodite and Ares. Through the next days, however, the Trojans had the upper hand. They drove back the Acheans to their camp. On the first day of the Trojan attack they were stopped at the Achean wall by Poseidon. The next day, though, with Zeus' help, the Trojans broke into the Achaean camp and were on the verge of setting fire to the Achaean ships. An earlier appeal to Achilles to return was rejected, but after Hector burned Protesilaus' ship, he allowed his close friend and relative Patroclus to go into battle wearing Achilles' armor and leading his army. Patroclus drove the Trojans back all the way to the walls of Troy and was only prevented from storming the city by the intervention of Apollo. 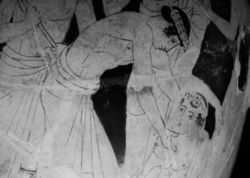 Patroclus was then killed by Hector (with Apollo's help), who took Achilles' armor from the body of Patroclus. Achilles, maddened with grief, swore to kill Hector in revenge. He was reconciled with Agamemnon and received Briseis back, untouched by Agamemnon. He received a new set of arms, forged by the god Hephaestus, and returned to the battlefield. He slaughtered many Trojans, and nearly killed Aeneas, who was saved by Poseidon. Achilles fought with the river Scamander, and a battle of the gods followed. The Trojan army returned to the city, except for Hector, who remained outside because he was tricked by Athena. Achilles killed Hector, and afterwards he dragged Hector's body from his chariot and refused to return the body to the Trojans for burial. The Achaeans then conducted funeral games for Patroclus. Afterwards, Priam came to Achilles' tent, guided by Hermes, and asked Achilles to return Hector's body. The armies made a temporary truce to allow the burial of the dead. The Iliad ends with the funeral of Hector. 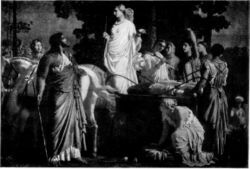 Shortly after the burial of Hector, Penthesilea, queen of the Amazons arrived with her warriors. Penthesilea, daughter of Otrere and Ares, had killed by accident her sister Hippolyte. She was purified from this by Priam and in exchange, she fought for him and killed many, including Machaon (although according to Pausanias, Machaon was killed by Eurypylus) and according to one version Achilles himself, who was resurrected at the request of Thetis. Penthesilia was then killed by Achilles who fell in love with her beauty, after her death. Thersites, a simple soldier and the ugliest Achaean, taunted Achilles over his love and gouged out Penthesilea's eyes. Achilles slew Thersites, and after a dispute sailed to Lesbos where he was purified for his murder by Odysseus after sacrificing to Apollo, Artemis and Leto. While they were away, Memnon of Ethiopia, son of Tithonus and Eos came with his host to help his stepbrother Priam. He did not come directly from Ethiopia, but either from Susa in Persia, conquering all the peoples in between, or from the Caucasus, leading an army of Ethiopians and Indians. He wore armor made by Hephaestus, like Achilles. In the ensuing battle, Memnon killed Antilochus, who took one of Memnon's blows to save his father Nestor. Then Achilles and Memnon fought. Zeus weighed the fate of the two heroes, and the weight containing that of Memnon sank, and Memnon was slain by Achilles. Achilles chased the Trojans to their city which he entered. The gods, seeing that he had killed too many of their children decided that it was his time to die. He was killed by Paris with a poisoned arrow that was guided by Apollo. In another version he is killed by a knife to the back (or heel) by Paris while marrying Polyxena daughter of Priam in the temple of Thymbraean Apollo, the site where he had earlier killed Troilus. Both versions conspicuously deny the killer any sort of valour, saying Achilles remained undefeated on the battlefield. His bones were mingled with those of Patroclus, and funeral games were held. Like Ajax, he is represented as living after his death in the island of Leuke at the mouth of the Danube where he is married to Helen. son: this great Odysseus cared not to do. Why, what is this you say? A thing against reason and untrue! According to Pindar, the decision was by secret ballot among the Acheans. In any case the arms were awarded to Odysseus. Driven mad with grief, Ajax desired to kill his comrades, but Athena caused him to mistake the cattle and their herdsmen for the Achean wariors. In his frenzy he scourged two rams, believing them to be Agamemnon and Menelaus. In the morning, he came to his senses and killed himself by jumping on the sword that had been given to him by Hector, so that it pierced his armpit, his only vulnerable part. According to an older tradition he was killed by the Trojans who, seeing he was invulnerable, attacked him with clay until he was covered by it and could no longer move, thus dying of starvation. After the tenth year, it was prophesied that Troy could not fall without Heracles' bow (which was with Philoctetes in Lemnos). So Odysseus and Diomedes retrieved Philoctetes, whose wound was healed. Philoctetes then shot and killed Paris. According to Apollodorus, Paris' brothers Helenus and Deiphobus vied over the hand of Helen. Deiphobus prevailed and Helenus abandoned Troy for Mt. Ida. But Chalcas said that Helenus knew the prophecies concerning the fall of Troy, so Odysseus waylaid Helenus. Under coercion, Helenus told the Acheans that they would win, if they retrieved Pelops' bones, persuaded Achilles' son Neoptolemus to fight for them, and stole the Trojan Palladium. The Greeks retrieved Pelop's bones, and sent Odysseus to retrieve Neoptolemus, who was hiding from the war in king Lycomedes's court in Scyros. Odysseus gave him his father's arms. Eurypylus, son of Telephus, leading a large force of Kêteioi according to Homer (could they be Hittites?) or Mysians according to Apollodorus, arrived to aid the Trojans. He killed Machaon and Peneleus but was slain by Neoptolemus. 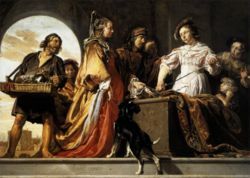 Disguised as a beggar, Odysseus went to spy inside Troy, but was recognized by Helen. Homesick, Helen plotted with Odysseus. Later, with Helen's help, Odysseus and Diomedes stole the Palladium. The hollow horse was filled with soldiers led by Odysseus. The rest of the army burned the camp and sailed for Tenedos. When the Trojans discovered that the Greeks were gone, believing the war was over, they "joyfully dragged the horse inside the city", while they debated what to do with it. Some thought they ought to hurl it down from the rocks, others to burn it, while others said they ought to dedicate it to Athena. 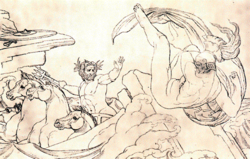 Both Cassandra and Laocoön warned against keeping the horse. But Cassandra, given the gift of prophecy by Apollo, was also cursed by Apollo to never be believed. Then serpents came out of the sea and devoured either Laocoön and one of his two sons, Laocoön and both his sons, or only his sons, a portent which so alarmed the followers of Aeneas that they withdrew to Ida. The Trojans decided to keep the horse and turned to a night of mad revelry and celebration. Sinon, an Achean spy, signaled the fleet stationed at Tenedos when "it was midnight and the clear moon was rising" and the soldiers from inside the horse emerged and killed the guards. 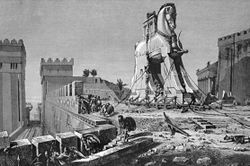 Some have suggested that the Trojan Horse actually represents an earthquake that occurred between the wars that could have weakened Troy's walls and left them open for attack. Structural damage on Troy VI—its location being the same as that represented in Homer's Iliad and the artifacts found there suggesting it was a place of great trade and power—shows signs that there was indeed an earthquake. Generally though today Troy VIIa is believed to be Homer's Troy (see below). That the work of Epeius was a contrivance to make a breach in the Trojan wall is known to everybody who does not attribute utter silliness to the Phrygians. where by Phrygians he means the Trojans. Karykas notes that 3,000, the number of men in the horse, according to Apollodorus, given by the oldest source, the Little Iliad, was the size of the crew of a helepolis, a piece of siege machinery of the hellenistic era. Furthermore he notes that the Assyrians at the time used siege machines with animal names. Robert Graves believes that Troy would have likely been taken by a wheeled wooden tower covered with wet horse hides protecting against incendiary arrows. The Acheans entered the city and killed the sleeping population. A great massacre followed which continued into the day. All up and down the city in their blood. Neoptolemus killed Priam, who had taken refuge at the altar of Zeus of the Courtyard. Menelaus killed Deiphobus, Helen's husband after Paris' death, and also intended to kill Helen, but overcome by her beauty, threw down his sword and took her to the ships. Ajax the Lesser raped Cassandra on Athena's altar while she was clinging to her statue. Because of Ajax's impiety, the Acheaens, urged by Odysseus, wanted to stone him to death, but he fled to Athena's altar, and was spared. Antenor, who had given hospitality to Menelaus and Odysseus when they asked for the return of Helen, and who had advocated so, was spared, along with his family. Aeneas took his father on his back and fled, and according to Apollodorus, was allowed to go because of his piety. The Greeks then burned the city and divided the spoils. Cassandra was awarded to Agamemnon. Neoptolemus got Andromache, wife of Hector and Odysseus, Hecuba, Priam's wife. The Achaeans threw Hector's infant son Astyanax down from the walls of Troy, either out of cruelty and hate or to end the royal line, and the possibllity of a son's revenge. They (by usual tradition Neoptolemus) also sacrificed the Trojan princess Polyxena on the grave of Achilles as demanded by his ghost, either as part of his spoil or because she had betrayed him. Aethra, Theseus' mother, and one of Helen's handmaids, was rescued by her grandsons, Demophon and Acamas. The gods were very angry over the destruction of their temples and other sacrilegious acts by the Acheans and decided that most would not return. A storm fell on the returning fleet off Tenos island. Also Nauplius, in revenge for the murder of his son Palamedes, set up false lights in Cape Caphereus (also known today as Cavo D'Oro, in Euboea) and many were shipwrecked. Nestor, who had the best conduct in Troy and did not take part in the looting, was the only hero who had a good, fast and safe return. Those of his army that survived the war also reached home with him safely but later left and colonised Metapontium in Southern Italy. Ajax the Lesser, who had endured more than the others the wrath of the Gods never returned. His ship was wrecked by a storm sent by Athena who borrowed one of Zeus' thunderbolts and tore it to pieces. The crew managed to land in a rock but Poseidon struck it and Ajax fell in the sea and drowned. He was buried by Thetis in Myconos or Delos. Teucer son of Telamon and brother of the other Ajax stood trial by his father for his brother's death. He was not allowed to land and was at sea near Phreattys in Peiraeus. He was acquitted of responsibility but found guilty of negligence because he did not return his dead body or his arms. He left with his army (who took their wives) and founded Salamis in Cyprus. The Athenians later created a political myth that his son left his kingdom to Theseus' sons (and not to Megara). Neoptolemus, following Helenus' advice who accompanied him travelled over land, always accompanied by Andromache. He met Odysseus and they buried Phoenix, Achilles' teacher, on the land of the Ciconians. Then they conquered the land of the Molossians ( Epirus) and had a child by Andromache, Molossus to whom he later gave the throne. Thus the kings of Epirus claimed descendance from Achilles, and so did Alexander the Great whose mother was of that royal house.Alexander the Great and the kings of Macedon also claimed descendance from Heracles. Helenus founded a city in Molossia and inhabited it, and Neoptolemus gave him his mother Deidamia as wife. After Peleus died he also succeed Phtia's throne too. He had a feud with Orestes, son of Agamemon over Menelaus' daughter Hermione and was killed in Delphi, where he was buried. In Roman myths the kingdom of Phtia was taken over by Helenus who married Andromache. They offered hospitality to other Trojan refugees including Aeneas who paid a visit there during his wonderings. Diomedes was first thrown by a storm on the coast of Lycia, where he was to be sacrificed to Ares by king Lycus but Callirrhoe, the king's daughter, took pity upon him, and assisted him in escaping. Then he accidentally landed in Attica in Phaleron. The Athenians, unaware that they were allies attacked them. Many were killed and the Palladium was taken by Demophon. He finally landed in Argos where his wife Aegialeia was committing adultery and, in disgust, left for Aetolia. According to later traditions he had some adventures and founded Canusium and Argyrippa in Southern Italy. Philoctetes due to a sedition was driven from his city and emigrated to Italy where he founded the cities of Petilia, Old Crimissa, and Chone, between Croton and Thurii. After making war on the Leucanians he founded there a sanctuary of Apollo the Wanderer, to whom also he dedicated his bow. For Homer Idomeneus reached his house safe and sound. Another tradition was formed later. After the war, Idomeneus's ship hit a horrible storm. Idomeneus promised Poseidon that he would sacrifice the first living thing he saw when he returned home if Poseidon would save his ship and crew. The first living thing was his son, whom Idomeneus duly sacrificed. The gods were angry at his murder of his own son and they sent a plague to Crete. His people sent him into exile to Calabria in Italy, and then Colophon, in Asia Minor, where he died. Among the lesser Acheans very few reached their homes. The murder of Agamemnon, from an 1879 illustration from Stories from the Greek Tragedians by Alfred Church. According to the Odyssey, Menelaus's fleet was blown by storms to Crete and Egypt where they were unable to sail away because the wind was calm. Only 5 of his ships survived. Menelaus had to catch Proteus, a shape-shifting sea god, to find out what sacrifices to which gods he would have to make to guarantee safe passage. According to some stories the Helen who was taken by Paris was a fake, and the real Helen was in Egypt where she was reunited with Menelaus at this point. Proteus also told Menelaus that he was destined for Elysium (Heaven) after his death. Menelaus returned to Sparta with Helen 8 years after he had left Troy. Agamemnon returned home with Cassandra to Argos. His wife Clytemnestra (Helen's sister) was having an affair with Aegisthus, son of Thyestes, Agamemnon's cousin who had conquered Argos before Agamemnon himself retook it. Possibly out of vengeance for the death of Iphigenia, Clytemnestra plotted with her lover to kill Agamemnon. Cassandra foresaw this murder, and warned Agamemnon, but he disregarded her. He was killed, either at a feast or in his bath according to different versions. Cassandra was also killed. Agamemnon's son Orestes, who had been away, returned and conspired with his sister Electra to avenge their father. He killed Clytemnestra and Aegisthus and succeeded to his father's throne. Odysseus' ten year journey home to Ithaca was told in Homer's Odyssey. Odysseus and his men were blown far off course to lands unknown to the Achaeans; there Odysseus had many adventures, including the famous encounter with the Cyclops Polyphemus, and an audience with the seer Teiresias in Hades. On the island of Thrinacia, Odysseus' men ate the cattle sacred to the sun-god Helios. For this sacrilege Odysseus' ships were destroyed, and all his men perished. Odysseus had not eaten the cattle, and was allowed to live; he washed ashore on the island of Ogygia, and lived there with the nymph Calypso. After seven years, the gods decided to send Odysseus home; on a small raft, he sailed to Scheria, the home of the Phaeacians, who gave him passage to Ithaca. There Odysseus traveled disguised as an old beggar by Athena he was recognised by his dog Argos who died in his lap. Then he discovered his wife was faithful to him all these years despite the countless suitors that were eating and spending his property all these years. With his son's Telemachus' help and those of Athena, and Eumaeus, the swineherd, killed all of them except Medôn, who had been polite to Penelope, and Phemius, a local singer who had only been forced to help the suitors against Penelope. Penelope tested him and made sure it was him, and he forgave her. On the next day the suitor's relatives tried to revenge on him but they were stopped by Athena. 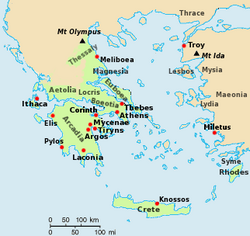 Years later Odysseus' son Telegonus of Circe came from the sea and plundered the island thinking it was Corcyra. Odysseus and Telemachus, defended their city and Telegonus accidentally killed his father with the spine of a stingray. He brought the body back to Aeaea and took Penelope, Odysseus' widow, and Telemachus, Odysseus' son, with him. Circe made them immortal and married Telemachus, while Telegonus made Penelope his wife. This is where the tale of the Trojan War for Greek mythology ends. According to a Roman tradition Odysseus did not die this way: when old he took a ship to sea and, crossing the Pillars of Heracles he discovered the estuary of the Tagus river and found there the city of Lisbon. Aeneas led a group of survivors away from the city, including his son Ascanius, his trumpeter Misenus, father Anchises, the healer Iapyx, all the Lares and Penates and Mimas as a guide. His wife Creusa was killed during the sack of the city. They fled Troy with a number of ships, seeking to establish a new homeland elsewhere. They landed in several nearby countries that proved inhospitable and finally were told by a Sibyl that they had to return to the land of their forebears. They first tried Crete, where Dardanus had once settled, but found it ravaged by the same plague that had driven Idomeneus away. They found the colony led by Helenus and Andromache, but declined to remain. After seven years they arrived in Carthage, where Aeneas had an affair with Dido. Eventually the gods ordered him to continue onward (Dido committed suicide), and he and his people arrived at the mouth of the river Tiber in Italy. There a Sibyl took him to the underworld and foretold the majesty of Rome, which would be founded by his people. He negotiated a settlement with the local king, Lavinius, and was wed to his daughter, Lavinia. This triggered a war with other local tribes, which culminated in the founding of the settlement of Alba Longa, ruled by Aeneas and Lavinia's son Silvius. Three hundred years later, according to Roman myth, his descendants Romulus and Remus founded Rome. The details of the journey of Aeneas, his affair with Dido, and his settling in Italy are the subject of the Roman epic poem The Aeneid by Virgil. According to tradition though Carthage was founded in 814 BC, so the true Aeneas, if he had ventured to the West he would have found little more than villages. The glorious and rich city Homer describes was believed to be Troy VI by many twentieth century authors, destroyed in 1275 BC, probably by earthquake. 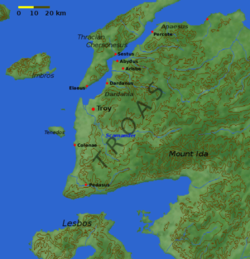 Its follower Troy VIIa, destroyed by fire at some point during the 1180s BC, was long considered a poorer city, but since the excavation campaign of 1988 it has risen to the most likely candidate. The historicity of the Trojan War is still subject to debate. 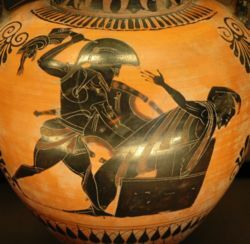 Homer's stories are believed by many to be the merging of military conflicts fought against Troy. In his merging, he creates many characters out of gods and uses many metaphors. 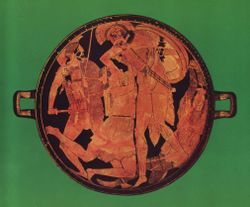 Most classical Greeks thought that the war was a historical event, but many believed that the Homeric poems had exaggerated the events to suit the demands of poetry. For instance, the historian Thucydides, who is known for his critical spirit, considers it a true event but doubts that 1186 ships were sent to Troy. Euripides started changing Greek myths at will, including those of the Trojan War. Around 1870 it was generally agreed in Western Europe that the Trojan War never had happened and Troy never existed. Then Heinrich Schliemann discovered the ruins of Troy and of the Mycenaean cities of Greece. 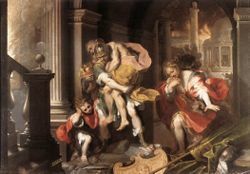 Today many scholars agree that the Trojan War is based on a historical core of a Greek expedition against the city of Troy, but few would argue that the Homeric poems faithfully represent the actual events of the war. Formerly under the Hittites, the Assawa confederation defected after the battle of Kadesh between Egypt and the Hittites (ca. 1274 BC). In 1230 BC hittite king Tudhaliya IV (ca. 1240 BC– 1210 BC) campaigned against this federation. Under Arnuwanda III (ca. 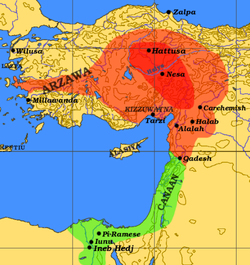 1210 BC– 1205 BC) the Hittites were forced to abandon the lands they controlled in the coast of the Aegean. It is possible that the Trojan War was a conflict between the king of Ahhiyawa and the Assuwa confederation. This view has been supported in that the entire war includes the landing in Mysia (and Telephus' wounding), Achille's campaigns in the North Aegean and Telamonian Ajax's campaigns in Thrace and Phrygia. Most of these regions were part of Assuwa. It has also been noted that there is great similarity between the names of the Sea Peoples, which at that time were raiding Egypt, as they are listed by Ramesses III and Merneptah, and of the allies of the Trojans. There is debate whether the communication network of the fire relays existed throughout the war and possibly worked both ways or it was an invention of Aeschylus. While there is evidence there was a fire-relay system in Greece in ancient or Byzantine times, there is no evidence that it was in place at the time of the Trojan War and Aescylus is the only surviving source that mentions it. That most Achean heroes did not return to their homes and founded colonies elsewhere was interpreted by Thucydides as being due to their long absence. Nowadays the interpretation followed by most scholars is that the Achean leaders driven out of their lands by the turmoil at the end of the Mycenean era preferred to claim descendance from exiles of the Trojan War. Even though Mycene was a maritime power that managed to launch over a thousand ships and Troy at the very least had built the fleet with which Paris took Helen no sea-battle takes place throughout the conflict and Phereclus, the shipbuilder of Troy, fights on foot. For Homer this is the old style of fighting, used by the more backward and small kingdoms like Pylus. Nestor describes a battle between Pylus and Elis that took place when he was young that was mainly fought with chariots. Achilles uses his chariot to go behind enemy lines and attack the Trojans from behind thus bringing about a great massacre. Karykas' believes that fighting on chariots was generally abandoned by the Acheans a little before the Trojan War and that Homer describes the battles as they took place. While the opinion that Homer is describing the war as it took place has appeared from time to time among modern Greek writers who were of the military profession the vast majority of scholars believe Homer is describing how war was waged at the time he lived. A full listing of works inspired by the Trojan War has not been attempted, since the inspiration provided by these events produced so many works that a list that merely mentions them by name would be larger than the full tale of the events of the war. 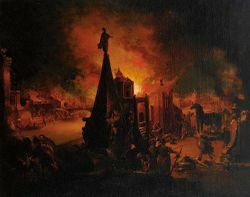 The siege of Troy provided inspiration for many works of art, most famously Homer's Iliad, set in the last year of the siege. Some of the others include Troades by Euripides, Troilus and Criseyde by Geoffrey Chaucer, Troilus and Cressida by William Shakespeare, Iphigenia and Polyxena by Samuel Coster, Palamedes by Joost van den Vondel and Les Troyens by Hector Berlioz. The war has also been featured in many books, films, television series, and other creative works.